The equipment bill of sale form ensures that transfer of ownership is done on a legal basis. The equipments can be office machine, machine for farming, vending machines etc. The forms can be of great use because of transaction purposes. You can get the Bill of Sale Forms easily in government offices or through private agencies. 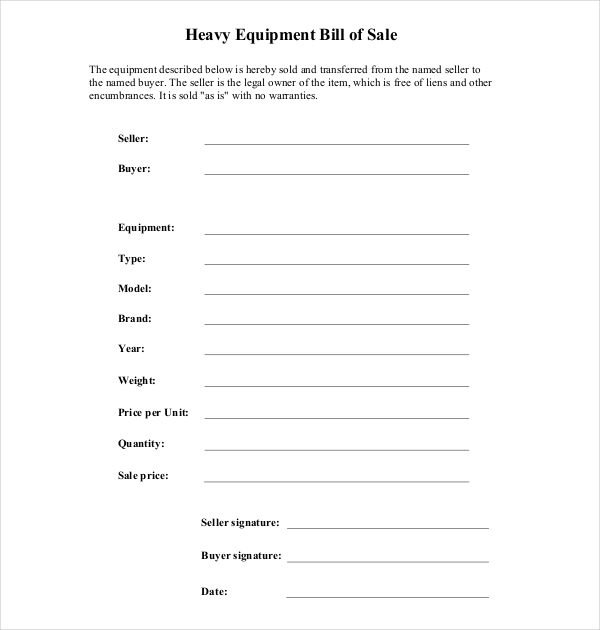 These heavy equipment bill of sale forms are used in many companies or business where the equipment in question is sold and transferred from the named owner to the named customer. The equipments are to be sold as is, without any warranties. Fields about buyers, sellers, equipment account and many more are to be written. Farm machinery bill of sale form is for the transaction machines that are used in farms. These can be crop cutter, harvester, livestock machinery, tractors, wine growing equipments etc. The necessary information like equipment description, buyer and seller information is needed. These are the primary information required for the transfer of ownership. Some people would like to use used equipment, or second-hand ones to save cost. 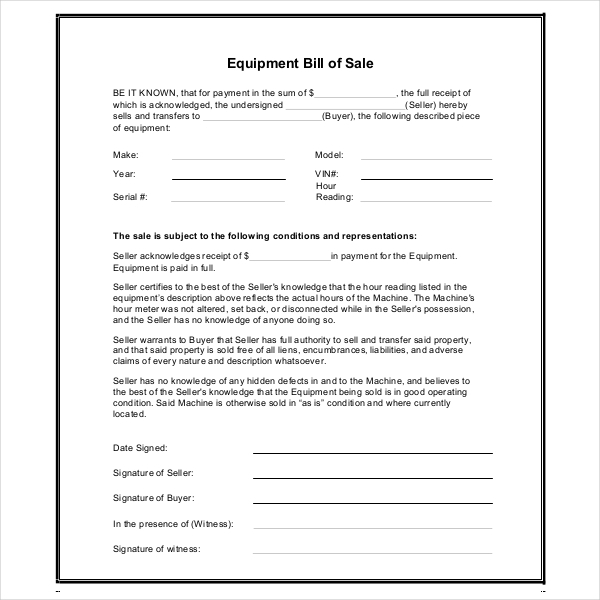 The bill of sale form for used equipment is required so that additional information about its usage, odometer read, and maintenance is known. The information of buyer and seller is given for the purpose of official records. 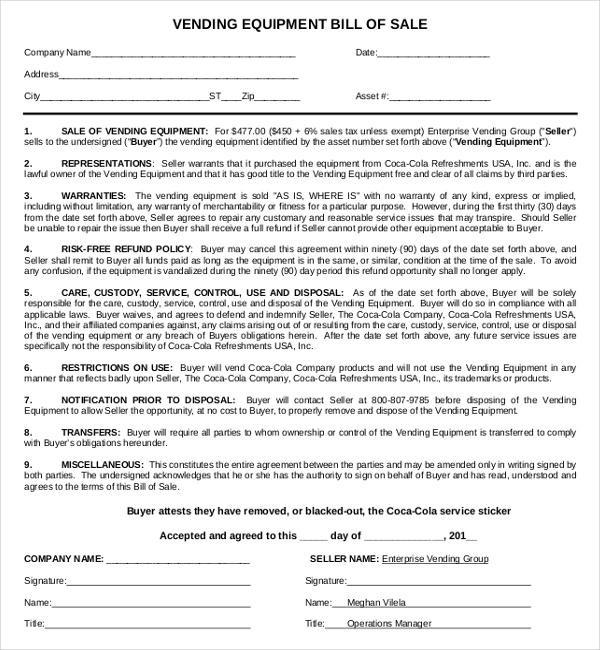 For those who are interested in buying equipments in bulk may use this form surplus equipment bill of sale form. This form requires the information of all the equipments that are being sold with extra details about it. These equipments once sold cannot be returned at any cost. The form is used for transactional purpose of any item. The buyers and the sellers can come to a mutual selling rate and agree buy signing the form. This is a legal procedure which has important uses in future. 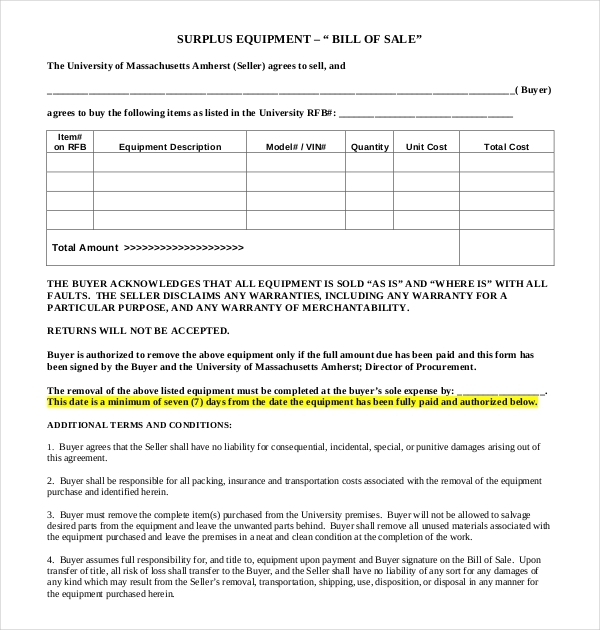 The free equipment bill of sale form needs details about the witness as well. All the information and original documents must be true to nature. Some workplaces use vending equipments for snacks and refreshment purposes. The equipment contains snacks and drinks for workers. The sale of this equipment requires information of both the seller company and the buyer company. Vending machines are useful for all workers but also for those who work overtime or have to stay in office overnight. People requiring equipments registration under Alberta province need this form. The last registered place must be mentioned about the equipment. This form is for the transfer of ownership of vehicles under the Alberta province. The information of the witness, purchaser and vendor is needed. There is a separate section for special conditions of sale. This section requires details of payment terms, vehicle last registered, payment form etc. Bill of Sale Forms- What are They? There are various legal documents that are used to get ahead in procedures. Bill of Sale forms are papers that show a transaction of an item between two parties, the buyer and the seller. The item can be a vehicle, furniture or any equipment related to workplace or housing. The paperwork is done to ensure that all parties have a proof in the court of law in case any problems occur. Bill of sale forms are for ownership of any goods in which 2 or more parties are interested mutually and in their own way. It can be for many purposes like buying or selling of, vehicles, equipments, animal, etc. There are general bill of sale forms, bill of sale forms according to places, horse bill of sale forms as well. Who All are Primarily Involved Around This Form? The buyer individual or company, the seller Company or individual, witnesses, original land/property/item owner (in cases as required) are few people that are involved for the procedure of transferring ownership. The mutual interest in a good or equipment leads to such transaction. The procedure may take time in some cases. The world is filled with legal procedures, hence, this bill may stay somewhere between the a formalized deed or title or in a simple cash register. This is a record of that the seller has sold the item of ownership to the buyer. The document is generally formulated by the seller. It includes the details of transaction that took place on a certain date. This form does not really prove ownership but only shows that the transfer of ownership took place. Nonetheless, this can still prove that a transaction regarding any item/goods indeed occurred formally. 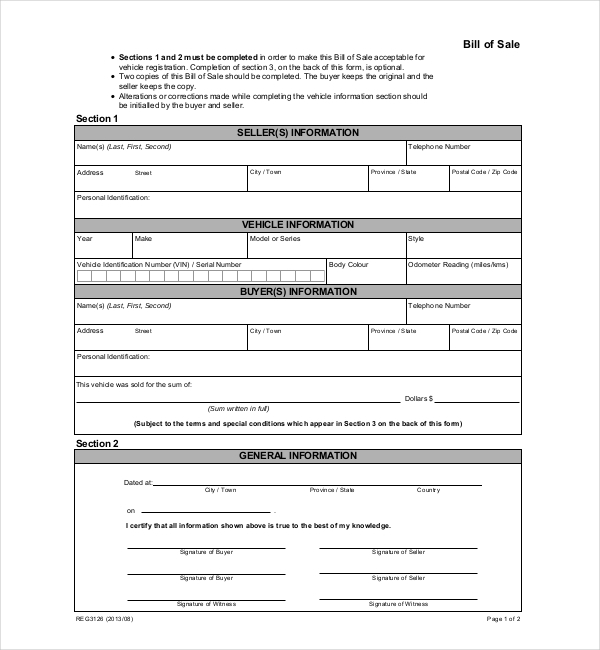 This form will be helpful for any incident of dispute relating to condition or details of transaction. Any equipment that is useful for a business and company need it for their own benefits. The equipment can be anything that increases the productivity of their business/company. The forms come in use so that they have transaction details or the equipment in a paper for future references like maintenance, warranty date, legal purposes etc. Note that only the bill of sale forms can only be used to transfer proprietorship of physical and portable goods and handover the possession of goods that have been used already. It can be used by any individuals or those who own private companies. Buyers will have an advantage of having a physical paper of the transaction taken place. A warranty and date of ownership is provided to the buyer for his knowledge. A seller company will gain comfort in tax reporting by showing this form. They have a protection of “as is” and also get the proof of date of ownership transfer. In a buyer’s perspective, this for is a good way to get the details of the sale in written format before the monetary exchange takes place. For a seller, a bill of sale helps in updating all the records. Hence the forms must be kept in a safe place for further reference. Misplacement of such paper works would create another set of legal problems which no one really wants. 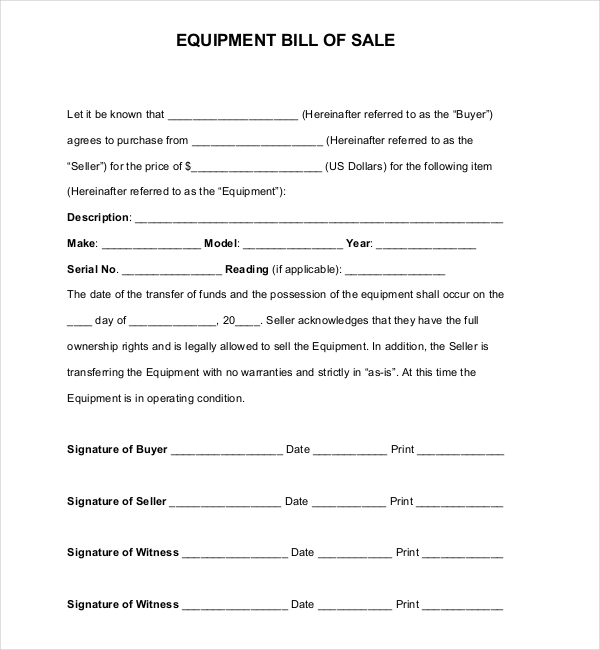 A seller company has to show documents and state a selling price of the equipment in question. This is seen by the buyer and an agreement is done through the bill of sale form. All the mentioned fields are filled up and verification of original documents of both parties is done by a witness or notary. Incorrect information or documents may lead to repeating of the process. Once the verification is done, the ownership is handed over to the respective person with full authority. Read and fill the form carefully. There is no hurry in doing so, as you are giving vital information for transferring ownership. Check thoroughly after filling these forms in case you have not missed anything. Make sure all the original documents are present while filling the forms. Original papers like registration card of equipment, buyer identification paper, seller ID, company’s paper, loan papers (if required) etc. 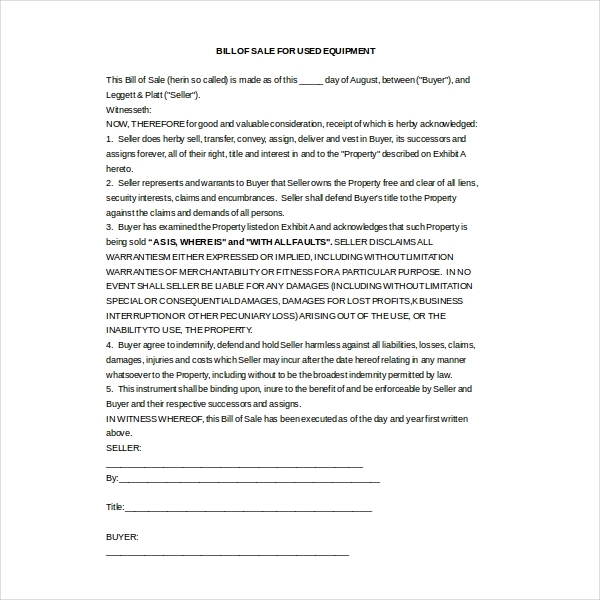 For all parties, it is advisable that the buyer can make a copy of this form to remain in the safer side. Give truthful information about the company, equipment and other areas. This is applicable for both parties involved in the transaction. Providing false information can lead to criminal offence. Clarify all the doubts before the handing over of the paper. This will make your life simpler by avoiding other problems and misunderstandings. Want to know on how to get these forms quickly? We have the solution for you. Our website provides all the forms that you need. These Bill of Sale forms are available online which are easily downloadable. They can be edited and printed as per your convenience. You can get these forms in version of higher and lower compatibility. If you want in a PDF or Word format, that is not an issue either, as we provide these forms in both formats at your convenience. The success rate of the templates that we provide in our website is very high, i.e., up to 99%. If you still require any changes in the forms, we will do it readily. These papers will be tailored as and when you need. Thus, you can save the extra stress. The forms are always in demand as any exchange or transaction of equipments requires paperwork for further processes. These forms have a power to keep you safe legally as any unpredictable situation can occur regarding any goods/equipment. Do not hesitate to give our website a chance. You are just one click away to get the required paper.